by Ornstein, Allan C.; Hunkins, Francis P.
Note: This is the bound book only and does not include access to the Enhanced Pearson eText. To order the Enhanced Pearson eText packaged with a bound book, use ISBN 0134290208. This balanced, comprehensive view of the entire field of curriculum encourages readers to consider choices and formulate their own views on curriculum foundations, principles, and issues. 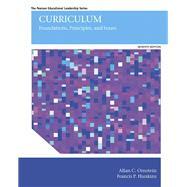 Rather than focusing on either theory or practice, or advancing a particular political or social position, or approaching the field of curriculum as an administrative challenge, this book gives readers the information they need to develop their own opinions on curriculum today as well as their outlooks for the future. Curriculum: Foundations, Principles, and Issues covers the latest topics in education that impact the curriculum and features Learning Outcomes, Discussion Questions, and Curriculum Tips to enhance understanding of the material. The Enhanced Pearson eText features embedded videos. Allan C. Ornstein is a professor of education at St. John’s University. He is a former Fulbright Hayes Scholar and has been a consultant for more than 60 different government and education agencies, including the American Federation of Teachers, the National Association of Secondary School Principals, and the Educational Testing Service. Dr. Ornstein has published more than 400 articles and 60 books. His latest books are Wealth vs. Work: How 1% Victimize 99% (Author House, 2012) and Excellence vs. Equality: Can Society Achieve Both Goals? (Paradigm Publishers, 2015). See his website: allanornsteinbooks.com. Francis P. Hunkins was a professor of education specializing in general curriculum, curriculum development, curriculum issues, and curriculum theory in the College of Education at the University of Washington for 35 years. Since retiring, Dr. Hunkins has remained active in writing educational textbooks. As a past president, he also remains active in the Association for Teaching and Curriculum. During his tenure at the University of Washington, Dr. Hunkins served as chairperson of the area of curriculum and instruction (1995–2000). He also consulted widely with school systems around the country. He twice was a visiting scholar at Monash University in Australia and was also a visiting scholar at the Hong Kong Institute of Education in 1999. Over his career, he has written 21 educational textbooks and numerous articles for educational journals. He makes his home with his wife, Dr. Patricia A. Hammill, in the Seattle area. Norman Eng is an adjunct assistant professor at the City University of New York, Brooklyn College and City College of New York. His work focuses on twenty first century education reform and inequality. He recently co edited a special issue symposium on Amazon.com and other websites, “Twenty first Century Excellence in Education” (Society, 2015), which included contributions from scholars such as Nel Noddings, Carol Ann Tomlinson, Yong Zhao, and James Comer. Dr. Eng maintains an education blog called The Educated Society.